75, the DVD, has been nominated for an Amadeus Award in Austria in the category Best Music DVD. You can vote for it by visiting the Austrian Music Awards web site. 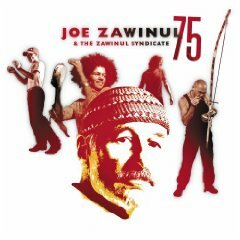 When you get there, click the Nächste button twice to get the to music DVD category, choose the Joe Zawinul DVD, then click the Voting Absenden button that appears at the bottom of the list. You will have to provide an email address, after which you will get an email in which you must click the link in order to confirm your vote. You can vote online until August 26. 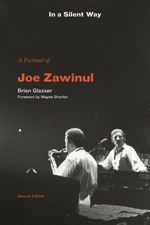 The second edition of Brian Glasser’s Zawinul biography, In A Silent Way, has just been published in softcover format. It can be purchased at Amazon UK. For a limited time, Brian will be signing all copies. The hardback version was originally published in February 2001. My review can be found here. The softcover picks up where the hardcover left off, taking the story through to Joe’s death in 2007 and a little beyond. It includes material from 18 new interviews, including luminaries such as Herbie Hancock, Chick Corea and Vince Mendoza. The photo section has updated, and there is a new forward written by Wayne Shorter. The first edition was essential reading for Zawinul and Weather Report fans. At the time, I described it as “the most revealing look yet at Zawinul’s musical career, as well as Weather Report’s inner workings.” The second edition makes it even more so. A must read.